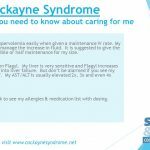 Hello and welcome to Share and Care, Cockayne Syndrome Network! 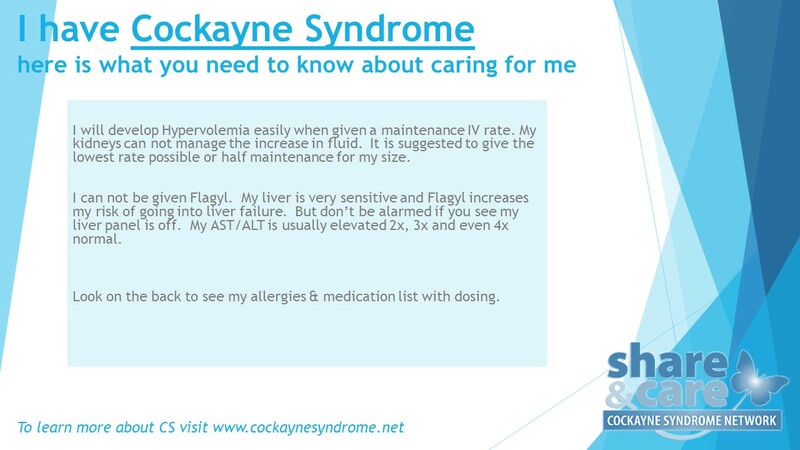 Receiving the diagnosis of Cockayne syndrome may seem overwhelming right now. You may be feeling confused, sad, fearful, and angry, all at the same time. You may not even know what questions to ask. This is a common and normal reaction. Though you may feel very alone at this time, it is important to know that, you are not alone, many have come before you and are eager to help. These 2 thing are the most important information you need to know and share with all of your child’s specialist and pediatrician. There is a lot of information on our website and on the internet, please do not try to absorb it all at once. Over the next few days, weeks and months you will begin to understand what the diagnosis means for your child, yourself, and the rest of your family. You will learn how to better care for your child’s unique needs, how to advocate for your child, and how to educate the medical community on ways to improve the comprehensive care your child requires. We recommend you contact the director of Share and Care and get a list of parent’s whom you can contact directly by facebook, telephone or email to get more information and support. Below you will find information for new parents who have recently had a child diagnosed with developmental disability and/or mental retardation. This information is intended for new parents of a child with special needs and highlights common feelings, reactions, fears, and struggles associated with the new diagnosis. The author also offers support and advice on how to adjust and cope with the news of your child’s diagnosis. If you have recently learned that your child is developmentally delayed or has a disability (which may or may not be completely defined), this message may be for you. It is written from the personal perspective of a parent who has shared this experience and all that goes with it. When parents learn about any difficulty or problem in their child’s development, this information comes as a tremendous blow. The day my child was diagnosed as having a disability, I was devastated — and so confused that I recall little else about those first days other than the heartbreak. Another parent described this event as a “black sack” being pulled down over her head, blocking her ability to hear, see, and think in normal ways. Another parent described the trauma as “having a knife stuck” in her heart. Perhaps these descriptions seem a bit dramatic, yet it has been my experience that they may not sufficiently describe the many emotions that flood parents’ minds and hearts when they receive any bad news about their child. 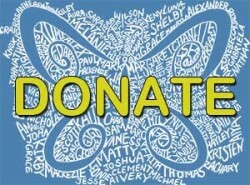 Many things can be done to help yourself through this period of trauma. That is what this paper is all about. In order to talk about some of the good things that can happen to alleviate the anxiety, let us first take a look at some of the reactions that occur. On learning that their child may have a disability, most parents react in ways that have been shared by all parents before them who have also been faced with this disappointment and with this enormous challenge. One of the first reactions is that of denial — “This cannot be happening to me, to my child, to our family. ³Denial rapidly merges with anger, which may be directed toward the medical personnel who were involved in providing the information about the child’s problem. Anger can also color communication between husband and wife or with grandparents or significant others in the family. Early on, it seems that the anger is so intense that it touches almost anyone, because it is triggered by the feelings of grief and inexplicable loss that one does not know how to explain or deal with. Fear is another immediate response. People often fear the unknown more than they fear the known. Having the complete diagnosis and some knowledge of the child’s future prospects can be easier than uncertainty. In either case, however, fear of the future is a common emotion: “What is going to happen to this child when he is five years old, when he is twelve, when he is twenty-one? What is going to happen to this child when I am gone?² Then other questions arise: “Will he ever learn? Will he ever go to college? Will he or she have the capability of loving and living and laughing and doing all the things that we had planned?” Other unknowns also inspire fear. Parents fear that the child’s condition will be the very worst it possibly could be. Over the years, I have spoken with so many parents who said that their first thoughts were totally bleak. One expects the worst. Memories return of persons with disabilities one has known. Sometimes there is guilt over some slight committed years before toward a person with a disability. There is also fear of society’s rejection, fears about how brothers and sisters will be affected, questions as to whether there will be any more brothers or sisters in this family, and concerns about whether the husband or wife will love this child. These fears can almost immobilize some parents. Powerlessness to change what is happening is very difficult to accept. You cannot change the fact that your child has a disability, yet parents want to feel competent and capable of handling their own life situations. It is extremely hard to be forced to rely on the judgments, opinions, and recommendations of others. Compounding the problem is that these others are often strangers with whom no bond of trust has yet been established. Disappointment that a child is not perfect poses a threat to any parents’ egos and a challenge to their value system. This jolt to previous expectations can create reluctance to accept one’s child as a valuable, developing person. Rejection is another reaction that parents experience. Rejection can be directed toward the child or toward the medical personnel or toward other family members. One of the more serious forms of rejection, and not that uncommon, is a “death wish” for the child — a feeling that many parents report at their deepest points of depression. During this period of time when so many different feelings can flood the mind and heart, there is no way to measure how intensely a parent may experience this constellation of emotions. Not all parents go through these stages, but it is important for parents to identify with all of the potentially troublesome feelings that can arise, so that they will know that they are not alone. There are many constructive actions that you can take immediately, and there are many sources of help, communication, and reassurance. There was a parent who helped me. Twenty-two hours after my own child’s diagnosis, he made a statement that I have never forgotten: “You may not realize it today, but there may come a time in your life when you will find that having a daughter with a disability is a blessing. ³I can remember being puzzled by these words, which were nonetheless an invaluable gift that lit the first light of hope for me. This parent spoke of hope for the future. He assured me that there would be programs, there would be progress, and there would be help of many kinds and from many sources. And he was the father of a boy with mental retardation. If there are other children, talk with them, too. Be aware of their needs. If you are not emotionally capable of talking with your children or seeing to their emotional needs at this time, identify others within your family structure who can establish a special communicative bond with them. Talk with significant others in your life — your best friend, your own parents. One positive source of strength and wisdom might be your minister, priest, or rabbi. Another may be a good friend or a counselor. Go to those who have been a strength before in your life. Find the new sources that you need now. A very fine counselor once gave me a recipe for living through a crisis: “Each morning, when you arise, recognize your powerlessness over the situation at hand, turn this problem over to God, as you understand Him, and begin your day. ³Whenever your feelings are painful, you must reach out and contact someone. Call or write or get into your car and contact a real person who will talk with you and share that pain. Pain divided is not nearly so hard to bear as is pain in isolation. Sometimes professional counseling is warranted; if you feel that this might help you, do not be reluctant to seek this avenue of assistance. Some parents seek virtually “tons” of information; others are not so persistent. The important thing is that you request accurate information. Don’t be afraid to ask questions, because asking questions will be your first step in beginning to understand more about your child. Learning how to formulate questions is an art that will make life a lot easier for you in the future. A good method is to write down your questions before entering appointments or meetings, and to write down further questions as you think of them during the meeting. Get written copies of all documentation from physicians, teachers, and therapists regarding your child. It is a good idea to buy a three-ring notebook in which to save all information that is given to you. In the future, there will be many uses for information that you have recorded and filed; keep it in a safe place. Again, remember always to ask for copies of evaluations, diagnostic reports, and progress reports. If you are not a naturally organized person, just get a box and throw all the paperwork in it. Then when you really need it, it will be there. Even for those living in isolated areas of the country, assistance is available to help you with whatever problems you are having. NICHCY’s State Resource Sheets list contact persons who can help you get started in gaining the information and assistance you need. While finding programs for your child with a disability, keep in mind that programs are also available for the rest of your family. My mother once told me, “When a problem arises and you don’t know what to do, then you do whatever it was that you were going to do anyway. “Practicing this habit seems to produce some normalcy and consistency when life becomes hectic. This person is your child, first and foremost. Granted, your child’s development may be different from that of other children, but this does not make your child less valuable, less human, less important, or in less need of your love and parenting. Love and enjoy your child. The child comes first; the disability comes second. If you can relax and take the positive steps just outlined, one at a time, you will do the best you can, your child will benefit, and you can look forward to the future with hope. Patricia Smith brings much personal and professional experience to the national parent and disability movement. She is currently the Executive Director of the National Parent Network on Disabilities. She has served as the Acting Assistant and Deputy Assistant Secretary in the Office of Special Education and Rehabilitative Services, in the U. S. Department of Education. She has also served as the Deputy Director of NICHCY, where she wrote and first published “You Are Not Alone”. She has traveled to almost every corner of the United States, as well as internationally, to share her hope and experience with families who have a member with a disability. Ms. Smith has seven adult children, the youngest of whom has multiple disabilities. She also has a seven year old adopted grandson who has Down syndrome.